Enzymes find extensive usage in textile processing, primarily for desizing and bio-polishing of various types of fabrics including cotton-based ones. They have gained substantial traction on account of their non-toxic and eco-friendly nature. These enzymes offer high efficiency and specific action, making them better substitutes than most strong acids, bases, and oxidizing agents used for textile processing. Changing fashion fads and rising disposable incomes of young adults across the world are trends driving the expansion of the textile enzymes market. The increasing focus toward sustainable textile processing in textile mills and garment laundries is fueling the strides of the market. Advances made in jeans desizing and synthetic fabric finishing will shape the evolution trajectory over the next few years. Industry players are focused on reducing the overall cost of production of textile enzymes in order to bolster their uptake. Furthermore, growing impetus by governments toward low-pollution textile processing in emerging economies will open new avenues in the global textile enzymes market. The global textile enzymes market stood at US$201.5 million in 2017 and is projected to clock a CAGR of 4.0% during 2018–2026. Textile enzymes have various applications such as desizing, bio-polishing, enzymatic bleaching, and bioscouring. The segments also consist of an others category that includes fabric softening, fabric dyeing, and fiber modification. Of these, bio-polishing presently holds the major share in the global textile enzymes market. The process has been extensively used for enhancing fabric appearance, reducing pilling, and softening cellulose-based fabrics. Meanwhile, the use of textile enzymes for desizing application is also prominent. The use is bolstered by growing popularity of lightweight denims and soft fabrics among customers worldwide. Based on type, the global textile enzymes market is segmented into cellulase, amylase, catalase, pectinase, and laccase, including a category of others. The others include glucose, mannanase, lipase, and peroxidase. Of all the segments, cellulase led the global market in 2017, vis-à-vis consumption. The growth is fueled by the increasing trend of fabrics with a markedly smooth and glossier appearance in various countries across the world. In the same year, the segment was trailed by the amylase enzyme type. The demand for this is driven by its use in desizing denims and various other apparels. 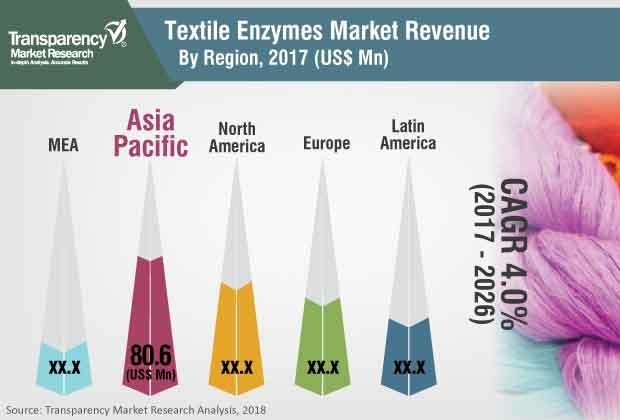 Regionally, the global textile enzymes market is segmented into North America, Asia Pacific, Latin America, Europe, and the Middle East and Africa. Vis-à-vis demand, Asia Pacific contributed the major share in the global market in 2017. The demand has been fueled by attractive strides in the regional textile sector over the past few years. This is compounded by constantly changing buying behaviors of consumers in the developing countries. Further, several globally prominent textile manufacturers have been shifting their production facilities to the region. Developed regions such as Europe and North America are expected to expand at moderate pace. Particularly, the Europe textile enzymes market is fragmented, especially in countries of Germany, the U.K., France, the Netherlands, and Italy. However, regulations pertaining to the use of chemicals in textile processing are getting stricter in various parts of Europe, thereby hampering the regional prospects. On the other hand, the demand for textile enzymes in North America is likely to rise at a modest pace, except in the U.S. where it will grow at attractive rate. Meanwhile, the markets of the Middle East and Africa and Latin America will rise an increasingly lucrative pace, and hence will play crucial role in contributing global revenues. This report analyzes and forecasts the market for textile enzymes at the global and regional levels. The market has been forecast in terms of volume (tons) and value (US$ Mn) from 2018 to 2026. The study includes drivers and restraints of the global market. It also covers the anticipated impact of these drivers and restraints on the demand for textile enzymes during the forecast period. The report also highlights growth opportunities in the global textile enzymes market. The report provides size (in terms of volume and value) of the textile enzymes market for the base year 2017 and the forecast between 2018 and 2026. Market numbers have been estimated based on type and application segments of the market. Market size and forecast for each major type and application segment have been provided for the global and regional markets.